Sakura RSG-61 Hematology Automated Slide Stainer Histology Pathology . New Life Scientific, Inc. This Sakura RSG Hematology Slider Stainer is in great working condition and good cosmetic condition with minor wear and staining. The wash reservoir, holding vessel, and slide baskets are stained from use. Two of the glass reservoirs are intact, but the third glass reservoir is cracked so it is being included as an extra item. 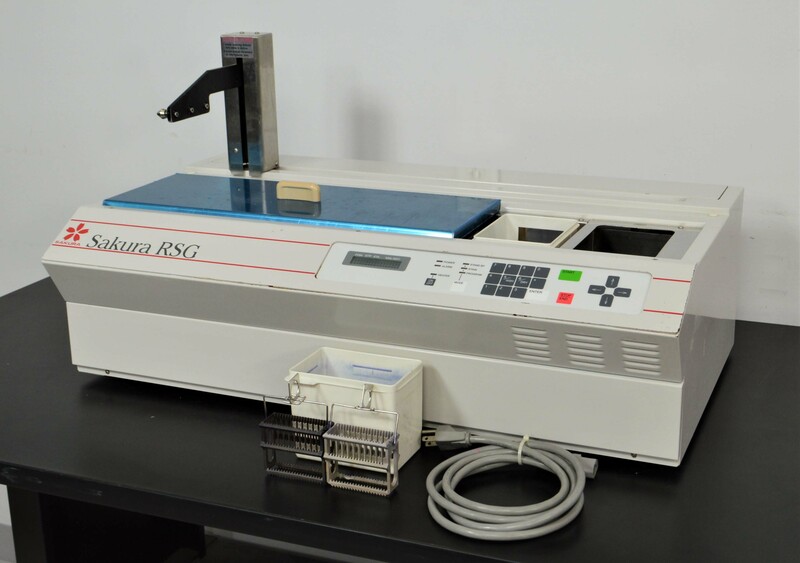 This Sakura RSG hematology slide stainer is in great working order and has been fully tested for functionality. Our in-house technician inspected and tested this Sakura RSG Hematology Slider Stainer, confirming it to be in great working condition. This slider stainer was able to change programming and run over two dozen simulated staining cycles without fault, proving it to be in great working order.